In the concluding part of the series on migrant fishermen, we look at the systemic failures in countries of origin and employment, that leaves them vulnerable to vagaries of more than just the sea. A stone’s throw away from the only landing centre in Muttam (a private one at that) is a modest concrete building. In a bright, airy, sparsely-furnished room is a metal cupboard filled to the brim with folders. Each contains a plea to officials and history of the fishermen’s journey from Kanyakumari to incarceration in a Gulf state or Iran. Some of these files are of fishermen who are being held to ransom by their sponsors. The letters written by South Asian Fishermen’s Federation are uniform in tone and structure. Sheets of passport-sized mugshots, with personal details and an explainer. Scenario 1: The fishermen are caught crossing borders and detained. The Indian embassies in both country of employment and detention are presented with details of the case and asked to help pay the fine and secure the fishermen’s release. Scenario 2: The fishermen have been going to sea for months, and the sponsor does not pay them for their share of their catch. After about six mfonths and sometimes even a year, the fishermen refuse to go to sea, and demand to be returned to their home countries. The sponsor refuses to issue an exit permit. The embassy’s help is sought to secure the permit. Every family in Muttam has a story, and the ones that don’t, answer every overseas call with dread. Or worse still, when they don’t hear from their men, they borrow other people’s stories to fill the gaps. 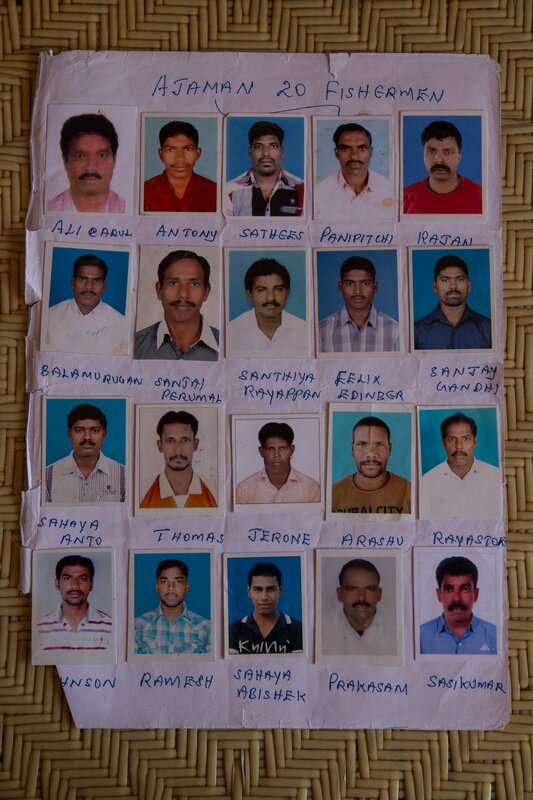 Yet, as soon as a boy turns 18 he heads to one of a handful of travel agents in Nagercoil, the closest town. As important as the kith or kin who would secure a job for them in the Gulf is the local travel agent, who will help them acquire a passport and process immigration papers. He lists a cocktail of reasons, most of which to do with the local government’s indifference, that escalates migration. The caste-based politics of India extends quite deep into Tamil Nadu, and explicitly impacts fishermen. 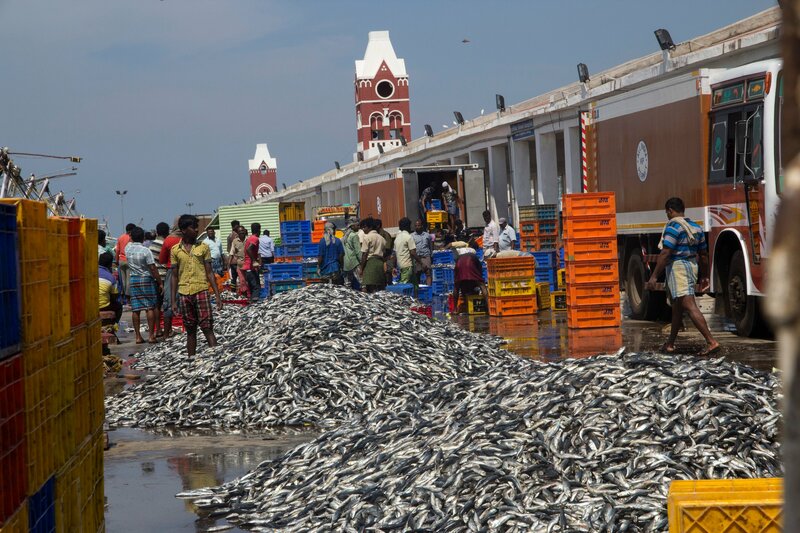 There are about 300,000 fishermen in Kanyakumari district alone. 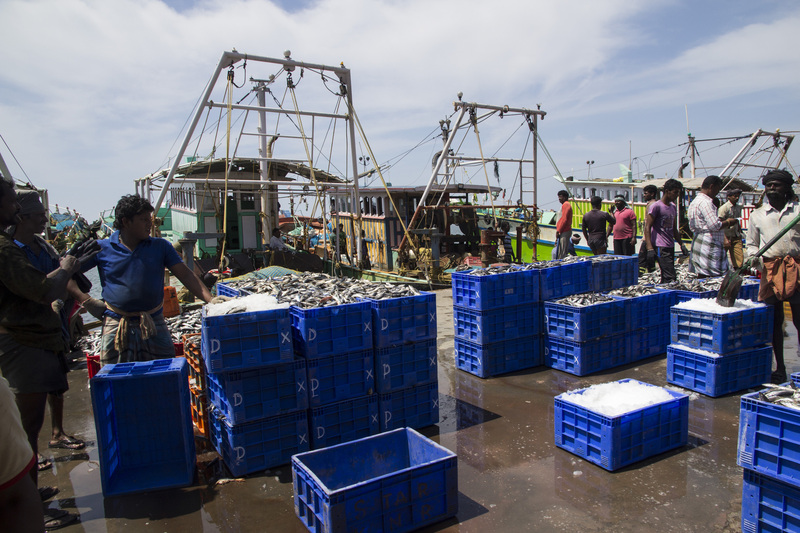 Of them 100,000 are active, and 50,000 have migrated – nearly 25,000 fishermen to the Gulf alone. Furthermore, because of extensive trawling the fish source has depleted drastically. Trawling remains a contentious issue between Sri Lanka and India, but neither have been able to quell the problem. The Indian boats, most of them owned by rich Tamil Nadu businessmen with strong political connections, have trespassed into Sri Lankan waters for several decades, ravaging the seabed with their heavy trawls. “They’ve erased the source of fishing. It is banned by the state, but people still do so. Because no alternatives are given,” explains Father Churchill. The week we visit Muttam is at the end of what the Tamils call ‘Modaku’. A two-month rest period for fish stock to replenish. Benjamin says this is the law of the sea, but the Gulf has introduced this only belatedly, after they felt the pinch of dwindling stock. Each coast has a different period allocated for this. So there are a few fishermen home on leave in Muttam. And they speak of Mangalam travels as much as they do about the 'Kafeel' or 'Arabi'. In a bustling junction near the local administrative offices is a dingy four-storeyed building. 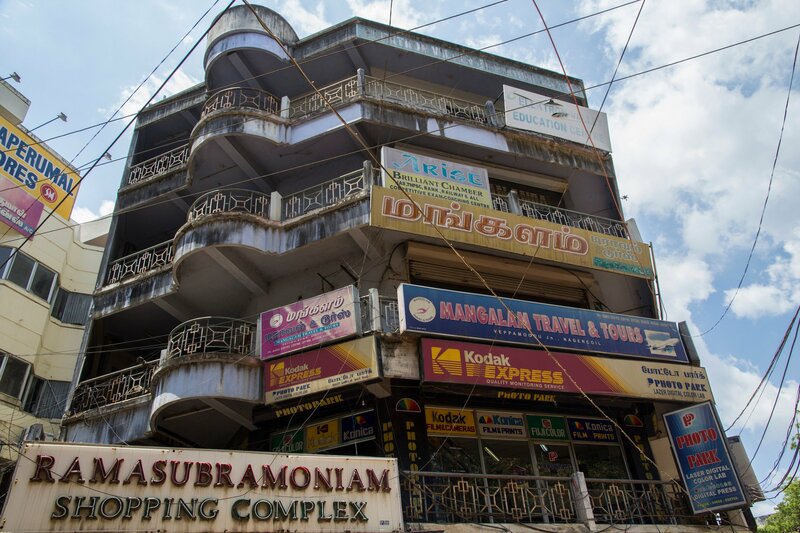 On the second floor is Mangalam travels. A well-lit contrast to the drab exteriors. Robin, a client servicing executive, spoke to us about the role of the agency in helping fishermen migrate. 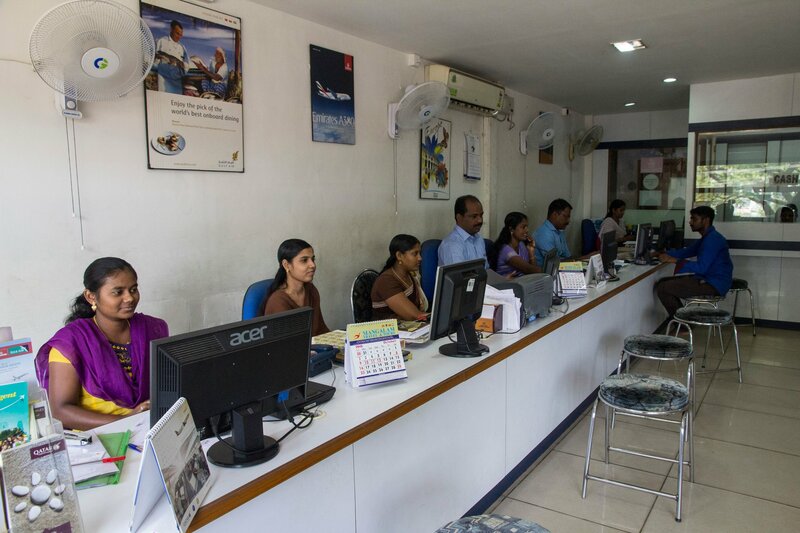 For every component there is a fee, and the total could be as low as Rs 10,000 (US$149) covering tickets alone, or as high as Rs 50,000 (US$750) that covers all the paperwork. This does not include amounts paid to the ‘captain’ as a recruitment fee. At no point in this process is a contract in play. They work without minimum wages, end of service benefits, a recognised contract or any kind of financial support. Shaja, whom we met in part 1 of the series, is well-versed in the ways of the Gulf. Her husband Ravikumar has worked in the Gulf for several years, first in Saudi and now in Dubai. First the UAE and now the rest of the Gulf states have set 5-day limit on the length of time the boat can be out at sea, to prevent overfishing. This reduces significantly the number of fishing days, and correspondingly, the number of earning days. And in those five days, they are encouraged to push their luck and violate boundaries. “In the fishing line sponsors are completely dependent on fishermen. So they won’t sign a contract. They can’t afford to pay if there’s been no catch,” says Robin, matter of fact. He says about 90% of their business is dependent on fishermen. They come with visas sent by people they trust. We help with processes. In a month 40-50 fishermen come to this agency alone, to get tickets and other paperwork done. “A lot of people come back cheated.” And there is no contract that they can hold to account. The fishermen are neither covered by the e-migrate system of India, nor the labor laws of countries of employment. They work in an unregulated vacuum, subject to the vagaries of commercial interests, climate change and blinkered governance. In the GCC, domestic workers are classified as those who work in private households as cooks, nannies, caretakers, gardeners, drivers. The fishermen, with their seaman’s visa, are excluded from the labor laws and fall under the purview of domestic workers immigration management. “The fishing community in Kanyakumari are adventurous. These are the only deep sea fishermen who migrate, even globally. They can stay up to 50 days at sea. So these men are sought after as they are good fishermen and adventurous. The Arab sponsors seek these fishermen out,” says Father Churchill. These sponsors, however, are not fishermen. They invest in the sea solely dependent on migrants to run the risky business. They find a captain, who then builds his crew. The captain is the one who communicates with sponsor on needs. He then puts out a call in his village, and the fish workers then pays the captain anywhere between Rs 100,000 to 300,000, he says. If things sour between sponsor and fishermen, then they are trapped in the kafala system, with little or no access to legal recourse. The fishermen survive on ‘advance’ and ‘running accounts’ in local grocery stores, as their share is not paid immediately. Even that share is disputed. Once the fishermen land in the Gulf, their passports are confiscated, and all that they have on them is a seaman’s identity card. For these men who spend days at sea, and months in seclusion away from their families, faith is a cornerstone of survival. Even that is under threat. 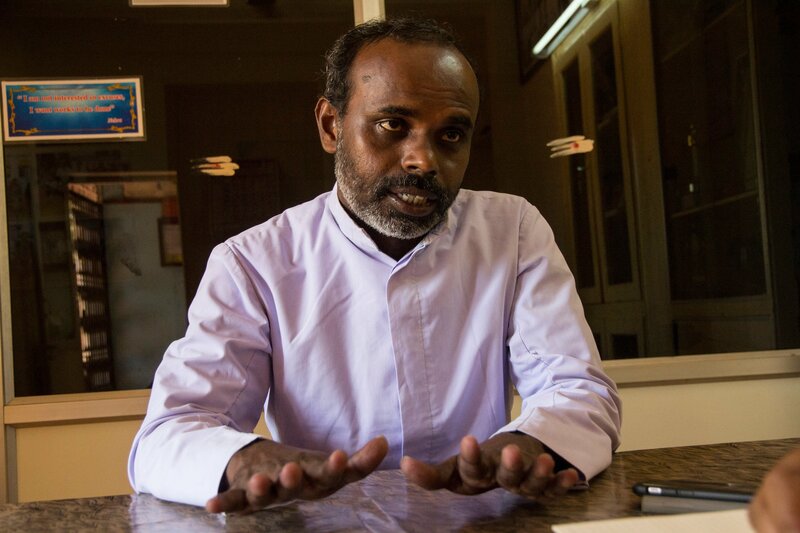 “For fishermen, their religion and faith is very important. And they can’t even carry any Christian iconography. For personal freedom, Qatar is better. They can practise their religion in their privacy of their homes. In Saudi they are attacked. The writer is the Associate Editor and Director of Projects at Migrant-Rights.org.